The newly updated Babolat Pure Drive is used by Fabio Fognini and Garbine Muguruza and has even more power than before. One of the ultimate fire-power racquets in the Babolat lineup, the Babolat Pure Drive has an open 16×19 string pattern that adds power and spin to anyone’s game. The racquet features FSI Technology which is designed to tighten the sweetspot’s string pattern and moves it higher for added power. From the baseline the Pure Drive crushes balls but can deliver a soft touch when needed. On serve the newly positioned sweetspot noticeably shines by adding a bit of height giving players a few extra inches of height at the point of contact for a better launch angle. Coming into the net is very easy thanks to the Pure Drive’s balance point (four points head light) but also lends to being very forgiving and comfortable when playing volleys. 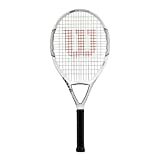 Overall the Babolat Pure Drive is a best seller that continues to be popular with players at all levels.